VC fundraising. 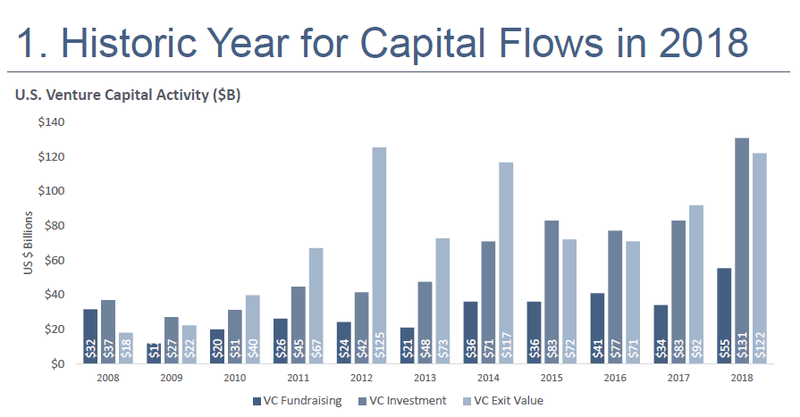 Venture capital firms raised $55mm in fresh capital in 2018, which is the most in the past 10 years and a nice rebound from the down year that was 2017. One year is not trend though, so we’ll look to 2019 to determine if 2018 was an anomaly or if more money is actually going to flow into venture capital. VC Investment. Venture investment far outpaced fundraising in 2018. In fact during 2018, the $131mm invested was equivalent to the past three years of capital raised. 2017 had a similar trend. Obviously it’s not possible for venture funding to dramatically outpace the amount of capital venture funds are raising themselves, so what is happening? What we’re seeing is proof of the existence of non-venture funds stepping into venture investing – this includes family offices, more traditional private equity firms, and strategic investors (corporations). We consider this to be tourist capital, but given the fact that investment has outpaced capital raised every year for the past 10 years, it looks like the tourists have all moved into town. This trend shows no sign of slowing. Exit Values. Exit values are ahead of capital deployed by a respectable amount. For the past 6 years, exit values have totaled $547mm. For the 6 year period from 2008 to 2013, investment totaled $230mm. Depending on industry, VC exits are usually on a 5 to 9 year cycle so comparing capital invested from 2008 to 2013 to exit values from 2013 to 2018 is a fair way to do this analysis. Based on that back-of-the-napkin analysis, cash on cash return has been 2.40x for the entire cap structure which is very respectable. Why does this matter? If VC’s generate good returns, they’ll be able to continue to attract capital themselves and feed the startup ecosystem.